Competition is growing when it comes to law firm SEO today. Everyone wants to be seen in the SERPs. Fortunately, there are some strategies that will help you get there. Many people think that law firm SEO is a set of tricks that makes Google think you have the best content. However, the search engine’s algorithm can see right through this. This is why you should focus on building great content, answering your clients’ questions, and making up for your competitors’ incompetence’s. Google chooses page content that provides clear, concise answers and definitions to search queries. They place these things in small boxes at the top of their site calling them a “featured snippet.” Many search engine experts refer to this as “position zero.” These contain well-written content written in down-to-Earth language (e.g. instead of “Will a grocery store’s premises liability policy help me if I’m injured?” write “Can I sue the grocery store because I slipped and fell, hurting my ankle, on a wet floor?”). Presenting questions and answers in this fashion will help you law firm SEO by encouraging Google to feature you in position zero. This will also help you optimize for voice searches. With this popularity comes the growing number of people asking questions that are answered through Google’s featured snippets – something you’ll want to optimize for. To optimize your law firm SEO start with providing the information the user is looking for. Be concise then go into more details later. Links for law firm SEO are still quite valuable. You don’t want junk though (e.g. links from bulk directory submissions, purchases, exchanges). It’s also important to remember to link to high-authority sites yourself as well. You can become one of these sites yourself by providing well researched articles that are backed by legitimate sources (e.g. articles about car accident rates linking to an insurance industry report; articles about estate planning linking to examples in the law itself). Ultimately your goal here is to show the search engines and your readers that you’re not making information up. You want to clearly demonstrate that your information is based on facts that are well documented by legitimate sources. 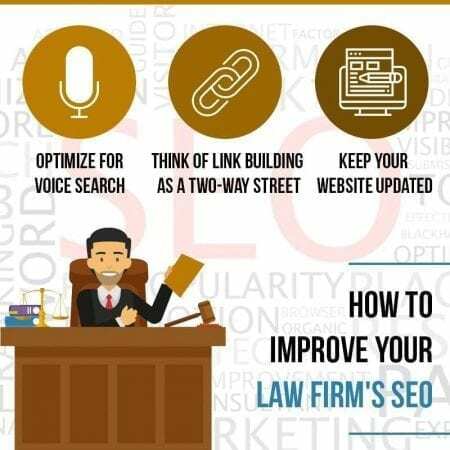 All of this will go a long way in helping you improve your law firm SEO. Use Google’s mobile-first indexing (e.g. schema markups). Make sure your website loads quickly and is easy to navigate. Offer interactive elements so your visitors are engaged with your content which should range from short questions and answers to longer, more in-depth pieces. Clearly describe your firm’s work and results. Include a clear call to action and an easy way to contact your firm. With a little help from ISEOU it’s possible for your law firm to remain competitive throughout this year. We’ll help you focus on your users, provide them with high-quality content, and refresh your website so contact us today.